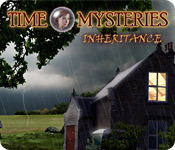 Time Mysteries: Inheritance is rated 3.2 out of 5 by 37. Rated 5 out of 5 by SparkleGlow100 from GORGEOUS, CLEAR & RELAXING WITH LOTS OF HOPS -BEAUTIFUL ARRANGEMENTS- It was the game-title picture that drew me - that cottage on the bleak hillside. Peaceful, time travel, older HOPA. Go to different time periods and places. Nothing frantic, nothing action-packed, but an absorbing, well told story nevertheless. You find yourself in castles and homes and outdoors in various centuries, extending way back as far as 8th century. Many enjoyable HOP scenes in this game, many that are beautiful to look at. In one particular type, you go back to is a room full of lovely odds and ends, including ornaments, weapons and garments that change every time you must enter. It has a gorgeous stained glass ceiling that also changes color each time you go in. To activate the time travel device, you go to this room and collect items. This game is so clear on computer full brightness, that you can play this during the day with blinds somewhat drawn and you’ll be able to see clearly. Gorgeous lighting effects on things many times GRAPHICS: Mix of real scenes/objects and non-real. For the first ¾, the clarity of the game is great. It deteriorates briefly for a few scenes, and then picks back up again. Does not fill the whole screen. HOPS: LOTS – 20 or so. Real items: trinkets, crowns, tools, food. Mostly easy to see for the first ¾. Even though they are clear, you do not find them at once, since they are pretty well hidden. Wow, check out the food HOP feast in the 8th Century, accompanied by medieval guitar. PUZZLES: Regular puzzles of the following type: At least 7 find the difference, some of fix the note/picture /pattern, by putting the pieces back together, some of activate all the buttons/lights, some of choose the right order and colors, some of slide the rectangles around to clear a pathway. Not for a puzzle fan…but fine for me! All are skippable. SOUNDS: 2. Music, and Sound. Lots of music appropriate to the time periods. Not big on sound apart from mouse actions. But the rest of the game more than made up for this. To be honest the quiet kinda suited this game. HINT: Yes. Instant. You can easily recharge these by playing Match-3. A minute of this and you get 3-4 hints depending on your score. At least twice the Hint– didn’t show me the item I needed to continue, but I figured it out. There IS a WALKTHROUGH on BFG if you need it. DIFFICULTY LEVELS: 2 and not changeable once selected. MAP: NONE, and not necessary. INVENTORY: NOT lockable, BUT it does stay up for several seconds if you are working on it. JOURNAL: Yes to keep notes. CHARACTERS: Meet various people and relatives across time. NO narration or voice-overs. You have to read. The characters are not animated like today's games. They are pretty much stationary with the main character having 3 expressions at the most! One of the characters is a ball! Rated 5 out of 5 by elvenemo from It's Great! I love the clean graphics, the huge numbers of time periods you visits, the backstory, historical accuracy, and the real sense of location and culture. At times the hint system was frustrating (it would just point to the objective in the room, and maybe not the item you overlooked), but overall it's great game that I will love to play again! Rated 5 out of 5 by kenya64 from One of my medieval favorites! 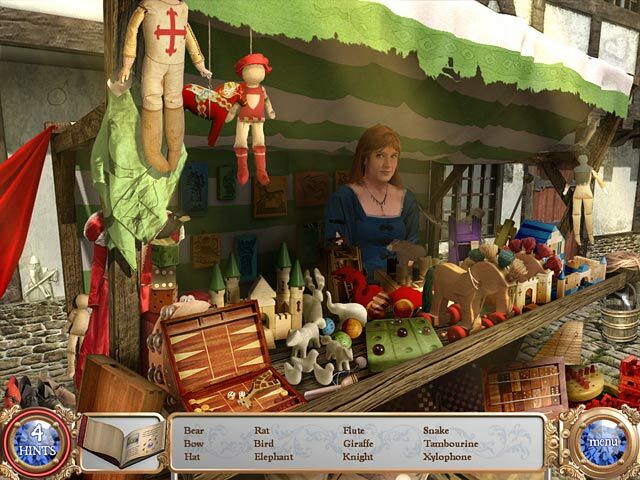 Get ready for a medieval spin on this hidden objects game. Love the storyline and the fantasy travel on this one. 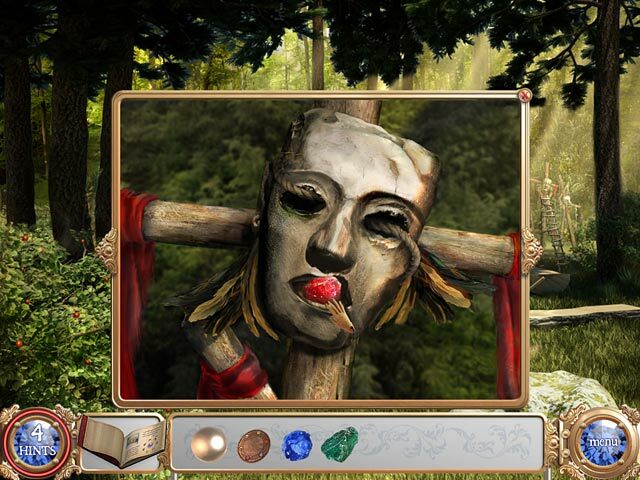 Awesome addition to your hidden object collection. Rated 5 out of 5 by Tassiegal from One of my favourites! I do like this game! It was one of the early HOGs I bought and I have played it several times. True, it's not the most challenging game in the world and true, getting from one chapter to the next is a somewhat repetitive process but for me it has a number of good points: 1) It's set in England - very welcome to an ex-pat Brit. One of the HOS's even has a CRICKET bat to find. Yay!! 2) The storyline really appeals to me. The final scene/denouement is really up my street (no spoilers here!) 3) I love the music. I have a respectable collection of Mediaeval and Renaissance music and much of the music in the game is familiar to me. 4) I like the way you can recharge hints by playing a mini-game. 5) It's light and bright for the most part - no repeated dismal grey scenery. [Aside: I wish that developers would get the message that there are lots of us out here who do NOT like the Twisted-Murder-In-Dark-Valley type of game, nor the depressing stories in sordid psychiatric hospitals.] I play games for relaxation and this one fits the bill nicely. It may not be everyone's cup of tea, so try before you buy. Rated 5 out of 5 by spectrumAU from Loved it! Interesting, fun, not too challenging. Easy to follow. Rated 5 out of 5 by BlazeBlues from Solid Hidden Object with some Adventure I'm giving this 5 stars based on the release date of this game. All games are bound to become dated but for now this one holds up well. It does stick to a basic formula with some repeat actions. But, each time the theme is changed and I think the storyline keeps it interesting. It is a game you either enjoy as an entire package or not so much if you only want the game play. I love Match 3 so I really enjoyed the option of playing one for a while to earn more hints. I found myself using hints more freely just to play the Match 3 for a couple of minutes. The mini-games were fun and while "spot the difference" is not my favorite mini-game, they were short and easy to get through. This is actually the second time I played this game. I just got the sequel and wanted to refresh my memory on the storyline in case it carries over. I did not find it tedious to play even a second time. In general, if you want a basically fun game with moderate challenge and a decent storyline, you will enjoy this. Rated 5 out of 5 by wahyukusuma from Good and Execellent Games I love this game. Especially, the hidden object sometimes hard to find. Rated 4 out of 5 by Zurreen from Pretty Good The storyline was quite original, and so was the presentation. 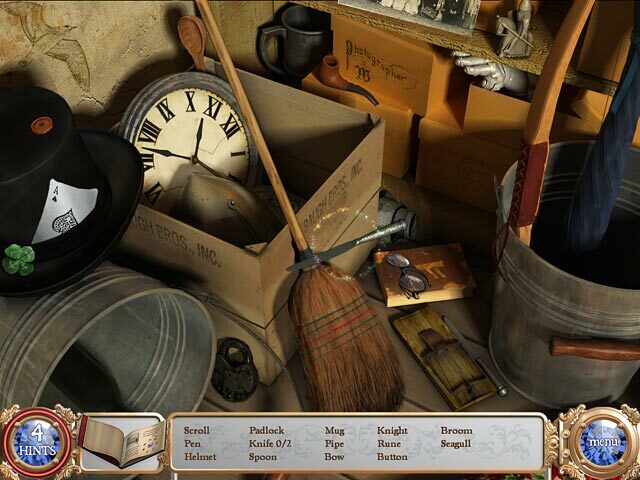 The Hidden Objects can be very small, but they are not impossible to find. Then again, if you do get stuck (or just don't want to rack your brains over that last pesky object or two), you can always use the Hint, which is available in both the Regular and the Expert modes. You can also use the Hints for the game itself. Keep in mind, however, you get only 4 Hints at a time. Not to worry though because, if you do use up the 4 Hints you initially get, you can always replenish them! Basically, the word "Hint" is replaced by "Charge Hints," in the lower-left of the screen. You click on "Charge Hints," and would get a message basically asking whether you want to do so. Accept, to get a quick round of Match 3!! !And it will be a rather quick round. But the grid is pretty simple, and the matches are easy to make. Depending on how well you do, you can replenish up to 4 Hints, which is the maximum number of Hints you get at a time. In fact, if you love Match-3 puzzles, you can use up your Hints fast, just to be able to play the Match-3 rounds! In addition to the HO scenes and possible Match-3 puzzles, you also get a number of Find-The-Differences puzzles. You can use your Hints in these puzzles also. There are other puzzles in the game, however, where you can't use a Hint for actual help. But they are all quite easy, and you can always click on "Solve" to SKIP any you don't like. In short, this is quite a fun game, with a very interesting storyline, good graphics, nice music, and a variety of rather simple HO scenes and puzzles. The only thing I did *not* like about the game was the absence of any voices. In other words, no voice acting whatsoever. That is not uncommon in many HO games, of course, but I think it was a rather big flaw in this particular game. And the alternative was not only cumbersome, but could be tricky too. You see, for the most part, you have to click to move the dialog along. At other times, the dialog seems to move on by itself, but after a rather long time, tempting you to click to "get on with it already!" But if you click too fast, you can easily skip a line and never know what you missed! So, all things considered, it really *would* have been nice if the developers had used voice actors. They could have used the subtitles as an additional help. Rated 4 out of 5 by gamefan10 from Very enjoyable HO game This is a game about going back in time to solve problems. I liked all the characters and the dialog was kind of humorous. I thought the game was original and enjoyed following the plot to see what happened. I wasn't aware that there were two other games in the series, but now that I've played this one I'll definitely get the other two. There was quite a bit of repetition in the game, like going to the same room to find artifacts for each time period, but each time it was a little different. Once you were in a time period everything was original. Not a lot of backtracking. The hint system was good. You can earn extra hints by playing a match-3 game. There were also find-the-difference games and other mini-games. I was impressed with the game, enjoyed playing it, and definitely recommend it.